In the second blog of the “Real Change in Romania” series, Simona Stewart, Director of House of Angels, gives an update on her orphanage and shares how nutritional support has impacted children in her care. 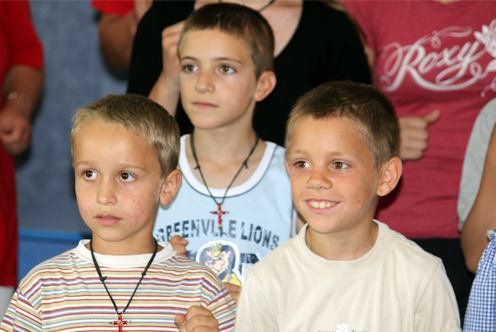 Starting in December 2009, House of Angels opened its doors to 20 new children with severe disabilities. They are orphans born with different mental and physical delays whose parents did not have the money and the knowledge to keep and raise them. After being abandoned in the hospitals, the kids were taken to the Special State Orphanage where they were doomed to remain until the age of 18. This state orphanage shares a courtyard with the House of Angels. For the last several years, I’ve personally been thinking how I can get those kids to the House of Angels because of the poor living conditions, especially the total lack of affection or stimulation. The saddest image of a 5 year old child balancing in a rusty swing on a cold and windy day in autumn, having a lost look in his eyes, has been haunting me for a long time. The image was so strong that I started contacting everybody and asking them for help to be able to get the children in our warm and cozy House of Angels. I’m happy and proud to say that starting last November, they became our little angels. They are living permanently in our orphanage now and I’ve seen smiles on their faces which was my biggest reward. House of Angels cares for the children coming from very poor families so they have a big lack of nutritional support due to the lack of food. The children were underweight and they could not concentrate on tasks. We’ve been giving the children the nutritional supplements that MannaRelief has provided and I can honestly say, IT HAS MADE A DIFFERENCE! The children are more active, they have reached normal weight ranges, and their immune systems are stronger. The nutritional supplements are very good and I believe that it was really a miracle that MannaRelief found us and provided us with nutritional support. This update is made possible by the Spare Change for Real Change campaign. House of Angels is a destination of MissionRomania 2010 scheduled for July. Blog photos are from MissionRomania 2009.